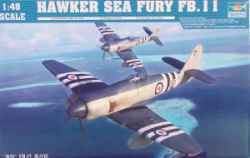 Modellers have waited a long time for a decent 1/48 scale kit of the Hawker Sea Fury, now we have one from Trumpeter. Sea Fury FB.11, VX691, T/130, Fleet Air Arm. Sea Fury FB.11, VW238, Q/107, Fleet Air Arm.